Mary Floyd-Wilson works in the field of early modern English literature, primarily drama placed in cultural, social, and intellectual contexts. 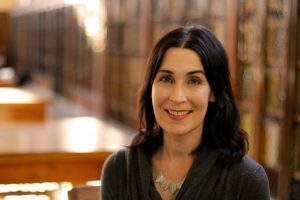 Past projects have included readings of Shakespeare’s Othello, Cymbeline, Macbeth, Ben Jonson’s Masque of Blackness, and Christopher Marlowe’s Tamburlaine in relation to the period’s understanding of ethnological differences–a discourse she identifies as “geohumoralism.” Her work on the history of emotion helped initiate the “affective turn” in early modern literary scholarship. Subsequent research has focused on the sympathies and antipathies (as central to a history of emotion), occult knowledge, and the construction of science in the period; this material has framed readings of Shakespeare’s Twelfth Night, All’s Well That Ends Well, Middleton and Rowley’s The Changeling, Webster’s The Duchess of Malfi, and the anonymous plays, Arden of Faversham and A Warning for Fair Women. She is currently writing a book titled The Tempter or the Tempted: Demonic Causality on the Shakespearean Stage about the distinct influence of the Protestant devil in early modern culture (with chapters on Thomas Heywood’s A Woman Killed with Kindness, Shakespeare’s Richard III, The Tempest, Macbeth, and Hamlet, Anon, A Yorkshire Tragedy, Ford, Dekker, and Rowley’s The Witch of Edmonton. “’Angry Mab with Blisters Plague’: The Pre-modern Science of Contagion in Romeo and Juliet,” The Palgrave Handbook to Early Modern Literature, Science, and Culture, edited by Howard J. Marchitello and Evelyn Tribble. (Palgrave, 2017). “’Some fury pricks me on’: Satanic Thinking in Thomas Heywood’s A Woman Killed With Kindness,” Embodied Cognition and Shakespeare’s Theatre: The Early Modern Body-Mind, ed. John Sutton, Evelyn Tribble, and Laurie Johnson (Routledge, 2014). Occult Knowledge, Science, and Gender on the Shakespearean Stage (Cambridge: Cambridge University Press, 2013), Choice Outstanding Academic Title 2014. Garrett A. Sullivan, co-editor, Environment and Embodiment in Early Modern England. (Palgrave Macmillan, 2007). Gail Kern Paster and Katharine Rowe, co-editors, Reading the Early Modern Passions: A Cultural History of Emotion. (University of Pennsylvania Press, 2004). English Ethnicity and Race in Early Modern Drama. Book. (Cambridge: Cambridge University Press, 2003). Bowman and Gordon Gray Distinguished Term Professor, awarded May 2014, term 2015-2020. Association of Graduate Students in English Mentoring Award, 2013. The Frank and Eleanor Griffiths Distinguished Chair in English Literature, awarded by the Bread Loaf School of English in the Summer 2013. Academy of Distinguished Teaching Scholars, University of North Carolina at Chapel Hill, 2006-present. Tanner Faculty Award for Excellence in Undergraduate Teaching, 2006.